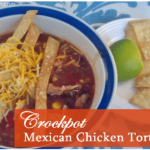 Jamie here, if you’ve been looking for yummy crockpot recipes to make tonight easy – here’s one of my family’s favorites! 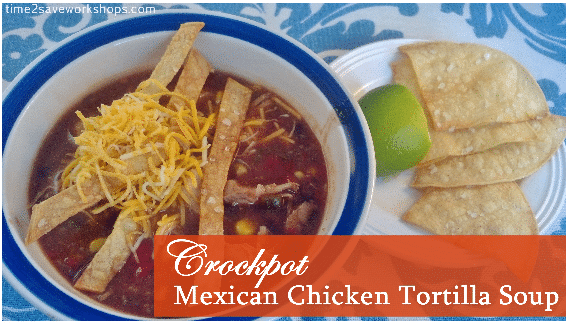 Here’s how to make this hardy, filling soup – and if you scroll down to the bottom – you can see the printable version as well 🙂 This takes 3-4 hours in the slow cooker on high or 6-8 hours on low. Get 2 or 3 boneless skinless chicken breasts out of the fridge or freezer, place them in the bottom of your crock pot and turn it on high. (frozen works just fine and will get done in plenty of time – that’s what I used) Now dice up half a red onion and add it to the slow cooker. *If you like more onion – use a whole one by all means, my family just doesn’t care for lots of onion. Next, add two cans of beans (drained), two cans of Ro-Tel, one can of tomato sauce, and one can of Mexi-corn (although regular corn is fine, as is a cup of frozen corn). Now that your chicken and canned goods are all getting acquainted, add one can of chicken stock (or a cup of water and a cube of boullion). Last but not least, stir in 1 packet of taco seasoning. If you like a little more kick – doctor it up with an extra sprinkle of cumin or cayenne. To give this soup a fresh taste – add a handful of chopped cilantro. I promise this makes a world of difference in this soup not tasting “canned”. After 3 hours, pull out the chicken and cut/shred it into bite-size chunks (don’t shred it too small, or it will mush together too much with the rest of the soup, texture-wise). Put the chicken back in and cook for the last hour. 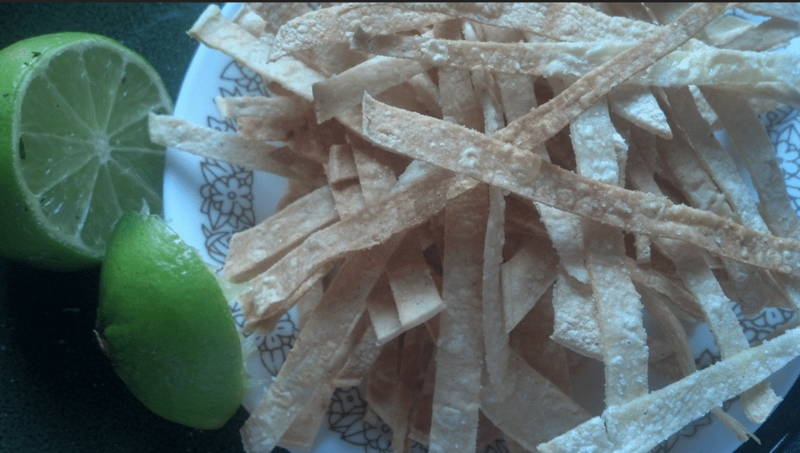 During the last hour – you can add in some strips of tortillas. (Corn or flour will work) I used my pizza cutter and zipped through 3 tortillas to make a couple handfuls of strips to add to the crockpot. This helped thicken the soup a little and served as a kind of “noodle”. Serve with shredded cheese and a squeeze of lime juice, you can add a little extra cilantro to make it extra pretty. You may also want to serve with sour cream or avocado slices. Put 2-3 boneless skinless chicken breasts in the bottom of your crock pot and turn it on high. Serve with shredded cheese and a squeeze of lime juice, maybe a little extra cilantro to make it extra pretty. Also sour cream or avocado slices make a nice finishing touch.